Gianmarco Piccioni... new Balzan signing. 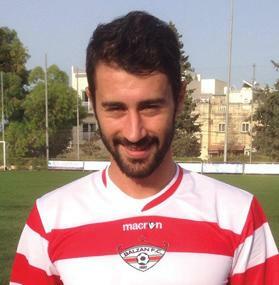 Balzan continued to strengthen their squad ahead of the new 2014/15 Premier League season after completing the signing of striker Gianmarco Piccioni. Coach Oliver Spiteri must be delighted to have secured Piccioni’s signature as the Italian forged a reputation as a powerful and clinical forward during his spell with Mosta last season. Since taking over from Jesmond Zerafa in the close season, Spiteri has been working to fine-tune his squad and the forward line has been an area of key importance. At Balzan, the 23-year-old Piccioni, the son of Mosta FC coach Enrico Piccioni, will be part of a new strikeforce following the arrivals of Colombian forward Oscar Guerrero, who had an excellent season with Vittoriosa Stars last season, and Jean Pierre Mifsud Triganza, signed on loan from Valletta. Spiteri has also sought to reinforce other areas, bringing in Colombian defender Elkin Serrano and Nigerian midfielder Osa Guobadia who owns a Macedonian passport. The 31-year-old Serrano has never played outside his native country before the move to Balzan while Guobadia, 27, was on the books of Israeli club Beitar Jerusalem last season. Spiteri has kept hold of Chilean midfielder Edison Bilbao Zarate who had teamed up with Balzan during the January transfer window. Balzan have also signed a host of Maltese players, including goalkeepers Steve Sultana and Chris Cassar and defenders Clive Brincat and Samir Arab. Elsewhere, former Parma midfielder Andrea Pisanu is expected to land in Malta this evening after agreeing to join Sliema Wanderers on a season-long loan. The 32-year-old is contracted to Bologna until June 2015 but has hardly featured for the Serie B club since joining them from Parma in 2010. Pisanu had loan spells with Prato and Montreal Impact in the last four years. Sliema have swooped for Pisanu after forward Stanley Ohawuchi flew out to Egypt to finalise his move to Wadi Degla. Wadi Degla had reached an accord with the Blues over the Nigerian’s transfer but sources said that the agreed fee has not been paid yet. If Wadi Degla fail to honour their financial obligations over the next few days, Sliema are likely to ask Ohawuchi to return to their fold.